The journey to Paris involved a drive from Guildford to the Thrifty Office at the Sheraton Heathrow, Thrifty bus to Terminal 4, Heathrow Connector to St Pancras, Underground to Kings Cross, Eurostar to Gare du Nord, RER to St Michel Notre Dame and a short walk to the hotel. The Hôtel Parc St Séverin is a simple, elegant seven-story boutique hotel on a corner of Rue de Parcheminerie with a typically French lift that is just wide enough for one suitcase. Our room on the fourth floor overlooked the Eglise St Séverin which sat under a crisp winter blue sky. 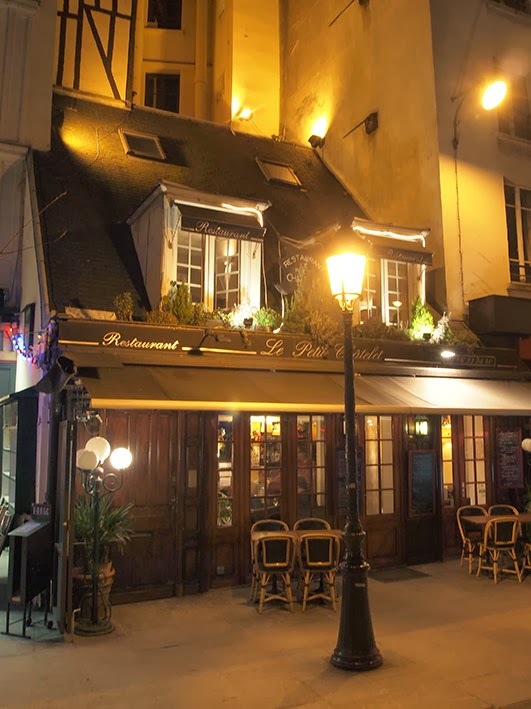 In the evening we walked to Le Petit Châtolet restaurant on Rue de la Bûcherie opposite Notre Dame. The dinner in the cosy restaurant was quite superb; Mrs M enjoyed salmon in olive oil while I savoured every moment of a plate of rognons de veau with a couple of glasses of house red. The waiter brought two small dishes of crème brulée that were shared until Mrs M said she would have liked both. Oh well, 't'empêche, tu perds' as the French do not say.